Cebu Pacific Piso Fare 2018: This is something we should be grateful for! Most of the Cebu Pacific promo fares last week has been extended. And this could only mean that we have more chances to book a plane ticket on promo to any select domestic destination in which the cheapest fare still available is Php 899. That is the same flight from Cebu to Kalibo (Boracay). Of course we just don't set our eyes set full on it as there are other domestic flights on promo as well. Those coming from Manila may have the advantage to visit Boracay directly or Coron for that matter. Summer is definitely near and this means that a lot of tourists both local and international are eyeing to spend their hot vacation in the beautiful island and pristine beach waters of Boracay! With that in mind, airline companies and even hotels and online booking sites in the Philippines are starting to offer promo packages and/or hot deals to their prospective clients. Planning for a summer trip is essential but first, check the calendars and book a plane ticket to your intended destination. 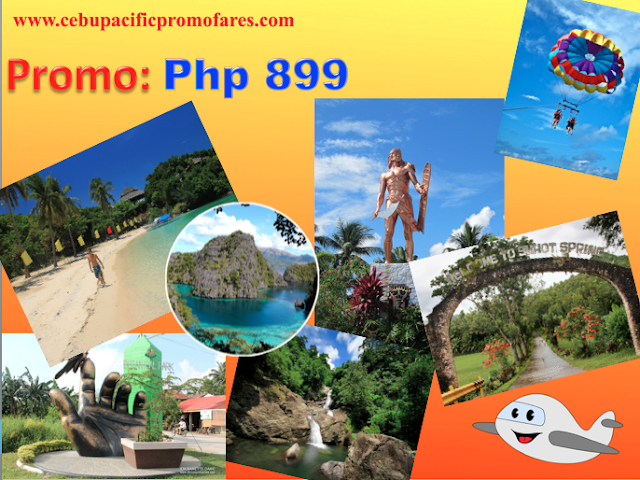 Let's check below all the possible promo fares from Cebu Pacific that you can purchase online. Book your tickets now, here. If we can compare these current promos to last week's, it's pretty much the same more or less. It is definitely a continued chance to all passengers and travelers like us to book the most affordable fare that we could. Well, have fund in booking your tickets with Cebu Pacific.